to basketballs and MP3 players. Dozens of companies and schools from across NYC were eager to help. AIG, Rubicon, Nickelodeon and FGI Finance held extremely successful drives, collecting hundreds of toys. Francesca, a thoughtful ten-year-old who’s already a seasoned toy-drive veteran, nearly doubled her efforts from last year and brought two truckloads of toys that she purchased with the help of friends and family. And we received nearly 300 gifts – many with warm holiday notes – from compassionate Americans across the country thanks to our new Amazon wish list that let caring folks everywhere easily participate in the drive. With the toys coming in, the holiday season became a flurry of activity as volunteers from Missy Farren Associates, Global Strategy Group, AIG, Curtis Brown Ltd, and UHY-US wrapped hundreds of the gifts for our annual holiday party in mid-December. 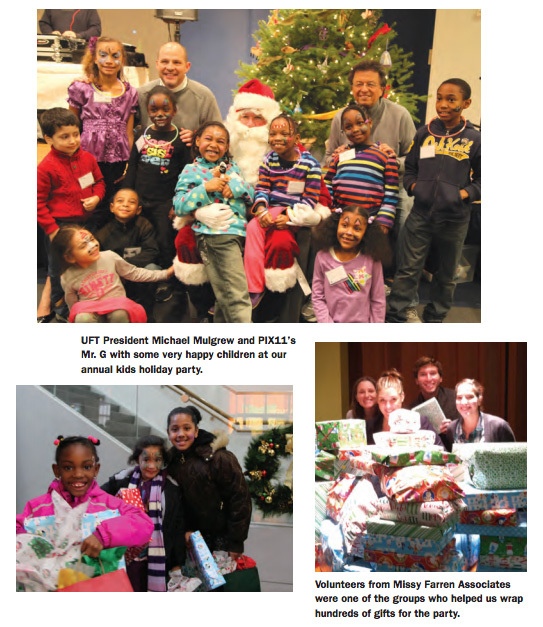 The party was a truly wonderful day – made possible by the kindness of the United Federation of Teachers (UFT). For one afternoon, 130 homeless girls and boys escaped the dreary life in a shelter for fun, music, games and great food. Our DJ got even the shiest kids moving on the dance floor, while face-painters turned our young guests into lions, butterflies and superheroes. Volunteers from Camp Homeward Bound entertained the kids with games and crafts, and artists from Xmental Inc. created personalized graffiti art for each child. The arrival of Santa brought squeals of delight as each child had a chance to sit on his lap and whisper holiday wishes in his ear. At the end of the party, PIX 11 weatherman Mr. G, UFT President Michael Mulgrew and other Coalition supporters pitched in to hand out the toys and other gifts to all the happy partygoers. Each child left with a glowing face – a reminder of the magic that the holidays can bring to us all. The remaining toys were delivered to homeless girls and boys in nearly a dozen other shelters by our Grand Central Food Program and Scattered Site Housing Program staff, so that hundreds more youngsters would have a bit of holiday cheer, even amidst their hardships. As we enter the New Year at a time of record child homelessness, we are deeply thankful to each of you who took the time to brighten a homeless girl or boy’s holiday this season.